The BBC is reporting this morning that one of our greatest composers, John Barry, has died at the age of 77 of a heart attack. For James Bond fans this is a particular blow, as Barry is the man who brought us the distinctive arrangement of Monty Norman’s Bond theme on 1962’s Dr No and scores for 11 of the movies. His lush orchestral work on pictures such as On Her Majesty’s Secret Service and You Only Live Twice stand as high points in both his career and cinema history, his compositions defining the sound of the espionage genre for generations of cinema-goers. Barry also worked on dozens of non-Bond features, such as Midnight Cowboy, Robin and Marian, Dances with Wolves and Out of Africa, while giving us the memorable themes to TV shows such as Juke Box Jury and The Persuaders. Oddly enough, today sees the release of two films on DVD here in the UK featuring his work. First up there’s What a Whopper from 1961, in which Adam Faith writes a book about the Loch Ness Monster, while 1968’s Deadfall is a Michael Caine heist movie with a twist (well, a few twists really). I’m not sure if they offer the best tribute to Barry, but they certainly show his diversity. Thanks to my interest in just about anything that resides in an archive and has a connection to film and TV (see my Charles Endell, Esquire post for more on that), the BBC Archive website is one I try to keep an eye on, mainly relying on their regularly updated Twitter feed. Over the last year or so they’ve brought us some fantastic collections, with their Genesis of Doctor Who and British Novelists sections of particular interest. The chance to listen to some radio interviews, read a memo or watch a clip from a BBC long gone is the closest I’ll get to having my own Tardis, and it’s one to savour. Last week saw the Archive team add a rather substantial early Christmas present to the site in the shape of a James Bond collection, a mixture of 15 radio and TV broadcasts and an image gallery making up the new section. While I’m not quite sure of the significance of December 2010 as a Bond anniversary, that doesn’t really matter when the content is this good. While most readers of this post can simply take a look around the site, I couldn’t resist jotting down my own thoughts on the collection. I also know that not all of the material can be seen/heard outside the UK, so perhaps it will be of some use to those not fortunate to be served by the BBC. Starting with the filmed content, the earliest footage on here is from the set of Goldfinger, Time Out – The Guns of James Bond from September 1964. After a very brief introduction from Sean Connery on the Fort Knox set of Goldfinger, we’re introduced to the man who was the inspiration for Q, pistol expert Geoffrey Boothroyd, who takes us through his range of guns and ammunition. For some reason Connery introduces Boothroyd as a Scotsman from Glasgow, only for Boothroyd to state a few moments later that the BBC have got it wrong and that he’s not Scottish at all. Whether Connery was fed duff information or the script is trying to emphasise the myths that surround Boothroyd I’m not sure (it appears to be the former) but this is still an interesting look into the world of a man who had such a major impact on the world of Bond. The Tonight programme from September 1964 is a fun four-minute clip in which presenter Kenneth Alsopp is invited to swap his E-Type Jaguar for Bond’s tricked-up Aston Martin DB5. At one point we see the revolving scanner in the driver’s wing mirror, which I don’t recall from the final film – has this been seen on screen since? Perhaps the jewel of this archive is Whicker’s World: Bond Wants a Woman They Said…But Three Would Be Better!, a documentary from March 1967 filmed on and around the set of You Only Live Twice. Around five minutes of this episode made it onto the two disc Ultimate Edition DVD, but here we get 53 minutes worth of solid gold documentary. This is an intimate look at the film’s production, with Whicker and his camera crew allowed to mingle with the producers, most notably Cubby Broccoli, and cast as they go about their work in Japan. Broccoli comes across as a shrewd-yet-friendly sort of chap, clearly revelling in the fame and fortune Bond has brought to his world, and he seems to have few worries, save for the fact that Connery had decided he’d soon be hanging up his Walther PPK for good. There are some classic moments captured on film, including a Japanese press conference which is thrown into confusion when an English-speaking journalist asks a question, only for Connery’s interpreter to insist on translating it anyway. Connery looks bemused by the whole thing and it no doubt added to his distaste of the Bondwagon he was riding at this time. We also see Connery and his colleagues partaking of custard creams on a small boat, an incongruous sight which shatters any illusion of a suave secret agent. Later we see the actor filming on Ken Adams’ impressive volcano set, while moments before Whicker was standing beside the real volcano in Japan. As an aside, while watching Connery running about Blofeld’s base in black and white I felt I was glimpsing some sort of alternate universe Bond, one which might have been had another set of producers got hold of the rights and decided to make B-movie versions of the Fleming novels. With his background in TV and smaller films, there’s a good chance Connery would have starred in those as well: this is as close as we’re likely to get to seeing how a series of Bond’s filmed entirely on the backlot of Pinewood or Shepperton might have looked. Broccoli’s back a few years later on the set of 1979’s Moonraker in Barry Norman’s Film 79. The producer is this time accompanied by the self-deprecating Roger Moore. Barry Norman pushes Moore on why he continually puts himself down in front of the cameras, and its fascinating to hear his response. The penultimate reel of Bond footage is from a November 1999 episode of the BBC’s long-running science series, Tomorrow’s World, screened a week before The World is Not Enough arrived in UK cinemas. A clunky looking backpack helicopter, a video camera which looked sophisticated 11 years ago and a robot which can help you mix a perfect dry martini are some of the goodies on offer, and the presenters enter into the spirit of it all (in particular Peter Snow who has a touch of the Q about him) but it’s pretty missable all round. Finally, on the eve of publication of Sebastian Faulks Devil May Care in 2008, BBC Breakfast invited Young Bond author Charlie Higson and novelist Kate Mosse in to discuss Fleming’s legacy. Radio-wise, the selection kicks-off with a cracking interview between Ian Fleming and fellow thriller writer, Raymond Chandler, from July 1958. The pair appear to have been left in a BBC studio with a packet of cigarettes and bottle of whisky between them, conversation shifting from their favourite novels to the differences in their writing styles. Things get very interesting when Fleming quizzes Chandler on how to set up a real-life mafia hit before asking him if he’d ever considered killing anyone himself. Chandler’s matter-of-fact response is a joy to listen to and takes Fleming slightly by surprise. I can’t praise this programme highly enough and it’s the one every Bond (and Chandler) fan should listen to if they want to get more of a feel for the man. From December 1974 there’s an overview of director Guy Hamilton’s career, including a brief interview with him. As well as insisting that a film’s budget should be seen on the screen and that on-set collaboration is vital, Hamilton has an interesting take on the character of Bond: he’s a latter-day Saint George, with the villains cast as the dragon. Broadcast in November 1990, a year after Licence to Kill had been released and five years before GoldenEye would arrive in cinemas, Radio 5’s Cult Heroes – James Bond wasn’t promoting anything (though the VHS of Licence may well have been hitting the shops) but Bond himself. There’s also a brief soundbite from Bond producer Michael G Wilson who states that everything is looking rosy for Bond at this point, though clearly that wasn’t to be the case for much longer. Legal battles would keep Bond off our screens for a while longer, but whether Wilson knew that or not is hard to know. Speaking of the 17th Bond movie, the original Moneypenny, Lois Maxwell, was drafted onto Radio 4’s Woman’s Hour along with journalist Anne Billson in December 1995 to discuss feminism in the series. This followed the arrival of Judi Dench as the first M in GoldenEye, something which put a new spin on the treatment of women in Bond. Maxwell explains her theory on the relationship between Moneypenny and Bond and agrees that the girls in the films needed updating. I liked Billson’s idea of a period version of the Bond films, once more setting them in the cigarette-smoke filled clubs of 1950s or 60s London rather than the rather dull present day of Facebook, X-Factor and iPads. Rather wonderfully, Maxwell, Lois Maxwell returns for Radio 2’s For Your Ears Only, again from December 1995. With the world clearly going Bond crazy again after a long wait for new Bond, the BBC this time decided to take listeners on a tour of the music archives. Beginning with a clip from the Fleming/Chandler interview mentioned above, Maxwell then introduces us to John Barry, Shirley Bassey, Paul McCartney and more, with soundbites from other interested parties. It’s a cheesy script but Maxwell seems to be having fun with it, and it’s great to hear her again, perhaps the most important Bond girl of them all. While most of the clips in this archive tend to play up to Bond’s penchant for bad one-liners, 1997’s Radio 4’s Books & Company goes one step further by employing a Sean Connery soundalike to introduce guests such as Bond author Raymond Benson, novelist Beryl Bainbridge and Fleming biographer Andrew Lycett. It’s a pointless gimmick but the content of this 8 minute feature is quite nice, with mentions of Kingsley Amis and some shattering of Bond myths. Describing Madonna’s Die Another Day theme as a “gimmicky, stuttering, forgettable mess,” before going on to interview former KGB man Oleg Gordievsky about potential terrorist scenarios for the Bond movies, only to have him provide one so realistic they couldn’t actually broadcast it, Joe Cornish’s Back Row programme on David Arnold is another highlight of the collection. Mark Gatiss also pops up to give the name of his ultimate Bond girl. The final two audios are a five-minute piece from Radio 4 to mark Ian Fleming’s 100th birthday, in which Gordon Corera goes to Fleming’s Goldeneye estate in Jamaica where he interviews the author’s gardener, and a 26 minute Radio 4 documentary entitled James Bond – The Last Englishman. This last piece is hosted by Professor David Cannadine, who reports from The Imperial War Museum’s 2008 Ian Fleming exhibition on the real-life inspiration for the Bond novels. Cannadine pinpoints two men, Wilfred ‘Biffy’ Dunderdale and Patrick Dalzel-Job, who may have impressed Fleming enough for him to write his books. It’s a nice potted history of Fleming’s early life and career, one of the more substantial pieces on here. Long time Bond fans will know most of this, but there are some nice soundbites from Andrew Lycett and Simon Winder, the latter the author of the controversial The Man Who Saved Britain. Finally, there’s a photo gallery from behind-the-scenes of 1976’s The Spy Who Loved Me, with roving reporter John Snagge shown meeting Roger Moore, Ken Adam and Barbara Bach on the film’s submarine set. So what can we learn from this little lot apart from the fact that Radio 4 loves James Bond and that Alan Whicker needs his own archive collection pretty sharpish? We certainly get to see Connery and Moore drop their guard and realise how disposable the actors playing Bond are, with Whicker and Norman keen to push Broccoli on the how soon they could be replaced on subsequent films. We also get a feeling for how important Fleming’s novels are to the literary establishment, even if they were looked down upon in their day, critics happy to brand them sadistic and nasty. Everyone has a view on them, positive or not, and the opportunity to hear Fleming in conversation in 1958 is almost all you need if you just want to dip in and out of this treasure trove. I do wish there had been something about George Lazenby’s time as Bond in the much maligned On Her Majesty’s Secret Service, along with something relating to Timothy Dalton. Something on the critical reception to each of the films on their original release would be welcome. Until any of that comes along I suspect this archive needs to be a moderate success, so I’d urge you to visit the James Bond collection and to enjoy at least one item, then to tell your friends about it on Twitter and Facebook – give a little Bond for Christmas. Visit the BBC Archive or follow them on Twitter. 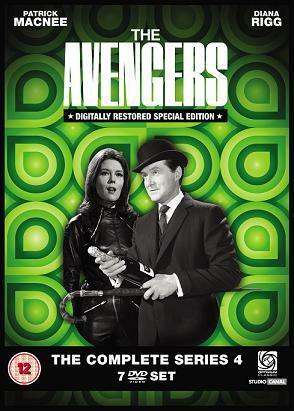 Exit Cathy Gale and enter Mrs Peel, as The Avengers truly hits its stride and the 1960s really start swinging. Series four of the classiest programme ever made saw Honor Blackman leave to fly aeroplanes for Auric Goldfinger as Patrick Macnee’s John Steed welcomed a new sparring partner in the shape of the sumptuous Diana Rigg. 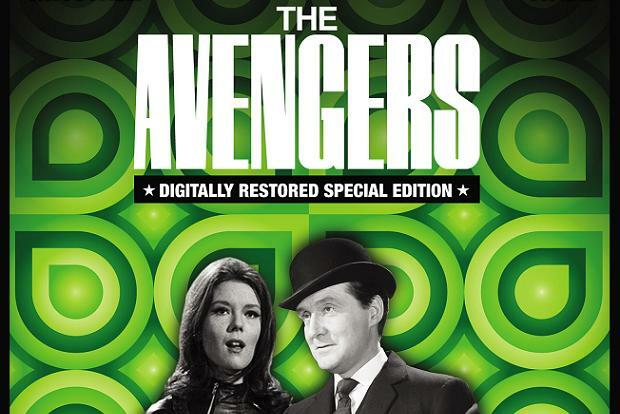 Shifting from videotape to 35mm film, one eye firmly on the burgeoning US market who wouldn’t accept anything less, 1965 was the year The Avengers really made its mark on TV audiences. Previous seasons may have introduced the populace to killer nuns, mad scientists and the odd loopy plot, but all this was taken to another level as Avengersland was created in the country lanes of middle England and behind the closed doors of every London gentleman’s club. Beginning with The Town of No Return, in which Steed and the newly introduced Emma Peel (her name coming from the idea that she had Man Appeal or ‘M Appeal’) visit a seaside town where ghosts from the past seem very much alive, the season moves from science fiction (The Cybernauts) to bizarre fantasy (Too Many Christmas Trees) and onto sado-masochistic camp (A Touch of Brimstone) with ease. Watching Steed fight with a baddie atop a miniature train with Mrs Peel strapped to the rail track may sound ludicrous, as might the end sequences which see the pair vanish into the distance by bicycle, in a coach and horses or on a magic carpet, but give in to the fun and you’ll have a ball. To put it bluntly, this is a series which has found the formula for success and manages to riff on it for 26 episodes that could only be improved by a dash of colour…but then that was only a year away as those Yanks demanded even more from Steed and Peel. Of course, whether colour actually made the series any better is debatable, as there’s undoubtedly something to be savoured in these crisp black and white episodes that look as good as new. This set also comes packed with extras, including commentaries from writers Roger Marshall, Robert Banks Stewart and Brian Clemens and directors Gerry O’Hara, Roy Ward Baker and Don Leaver plus a number of alternate sequences from episodes, stills galleries and PDF material from various sources. Perhaps the most welcome extras are the reconstructed season one episodes, Kill the King and Dead of Winter, screen captured photos tied together with narration. A more perfect piece of home entertainment you’ll struggle to find this year…at least until series five arrives in a few months time. As the world once more goes Bond mad, with Quantum of Solace fever spreading across the globe as it opens in each new territory (pity poor old Uruguay where Bond fans have to wait another month for the film), it seemed apt to take some time to watch the first season of I Spy, a show which debuted in 1965 when the original Bondmania was at its peak. The premise of I Spy was simple enough, though oddly the scriptwriters don’t go overboard attempting to explain it in the first few episodes: Kelly Robinson (Robert Culp) is an international tennis player, while Alexander Scott (Bill Cosby) is his coach. Together they traverse the globe, Robinson accepting invitations from the rich and famous to play against them or simply taking part in tournaments. But all is not what it seems as the pair are actually American spies working for the US Government, investigating nefarious goings on in various exotic locations. Mad scientists, rogue agents and gorgeous women are present in most of the first 28 episodes as the two spies move from Hong Kong to Vietnam to Japan and onto Mexico at the behest of their bosses. There are a few things that make I Spy stand out from most of their contemporaries. Firstly, unlike most TV series of the day (and of the present day), the production team actually went on location to the places they were meant to be. The first batch of episodes are set in Hong Kong so we see the Culp and Cosby on and around the island, taking the Star Ferry and pacing the backstreets of Kowloon. This gives the series a fantastic energy and colour that is lost when series are filmed on back-lots in Burbank. The other element that made me want to sit through this first season was the interaction between the leads. It’s fair to say that the show survives repeated viewing thanks to the banter of Robert Culp and Bill Cosby, the two constantly bouncing off each other from scene to scene. I’ve mentioned my admiration for Robert Culp before on this site and it was nice to see a younger Culp on form once again. A simple post title there for a simple enough post – Sir Roger Moore will be live at the National Theatre on October 16 2008 and I’m going to be in the audience! Out and about to promote his new book, My Word is My Bond, Roger will be interviewed on stage before signing copies for the masses. I can’t wait. Although Roger isn’t my favourite Bond, I can appreciate what he did for the film series when he took over from Sir Sean. He was also in one of my favourite series, Maverick, back in the 50s and he’s been in so many great/cheesy TV shows and films that he’s a genuine national treasure. I read his diaries written on the set of Live and Let Die a few years back and they are superb – if the new book is as funny it’ll be worth the trip alone. I was also lucky enough to tour the Forbidden City in Beijing in 2001, and decided to use one of those pre-recorded cassette thingies with the voice of a tour guide pointing out areas of interest. I was stunned to discover that the English language version was by none other than Roger himself! I had the joy of a 2 hour visit to the Forbidden City with James Bond! I’ll tell him that fascinating fact on the day. Maybe. If you’re going, drop me a line and I’ll see you at the bar for a swift Dry Martini before the show…for Queen and Country.